You curse moving out of the city for the umpteenth time. Rush hour traffic has turned your comparatively short 12 mile commute home into a snail’s-pace exercise in patience. You wait for your turn to move forward another few feet toward the interstate ramp, phone in hand, scrolling mindlessly through your social media notifications, when suddenly it makes a new, shrill chime. It doesn’t stop. The catchy tune on the radio is slashed abruptly by an equally, ominous tone. You tap the flashing banner on your phone. Suddenly, everything feels very far away, and very unreal: the message reads “Ballistic Missile Threat Inbound! – Seek Cover Immediately!” You look around to the other cars; almost every driver wears the same terrified face, heads bent down at phones or staring mutely at the radio. Nuclear attack preparation is once again climbing the ranks of plausible threats for preppers. Out of the dustbin of history, from Cold War-era Mutually Assured Destruction policies between superpowers to today, with the too-real brinkmanship occurring between the United States and rogue, progressively nuclear-armed dictatorships like North Korea. With the rise and fall of various regimes, and nuclear material being more accessible than ever, there is also the plausible, even probable, possibility of a terrorist group detonating a smaller nuclear device, or “dirty bomb,” in a major population center. Unleashing the power of a star upon activation, even the smallest strategic nuclear weapons possess stupefying destructive capability: blast wave and heat effects produce devastation and casualties miles beyond the epicenter of the blast. Assuming one is not killed or mortally wounded by either, then there is the simultaneous release of hard gamma radiation that can easily kill in hours or weeks, or if not gravely debilitate a victim, leading to a life ridden with cancer and disease. Even this is followed by the irradiated soot, dust and other particulates that will settle back to earth in the minutes and hours after the blast, the iconic “black soot” of nuclear fallout, which presents a significant threat to life for months afterward, hampering reoccupation and society in the aftermath. Considering that the nuclear warhead is the mankind’s ultimate and terrible total weapon, you may think that surviving the use of one may boil down to mere chance: hope and pray that it isn’t aimed your way. This is not the case. While survival anywhere near the epicenter of the detonation will be virtually impossible if one is not far underground in a specialty bunker or shelter, anything short of such misfortune is survivable, if you have warning, react quickly, and keep the appropriate sustainment supplies with you, or prepared in advance, you and your loved ones can survive both the detonation and resultant fallout with no or minimal ill effects. he information shared is not conjecture, and has been gathered from authorities in nuclear preparedness at the highest government and academic levels. Many readers will already have the fundamentals of such a plan in place, and will only need to make a few adaptations to their existing plans to facilitate survival of a nuclear strike. Others may be brand-new beginners, and if so, will see that the techniques, equipment and procedures listed will help to prepare one for a multitude of disaster and crisis scenarios of far lesser magnitude than a dreaded nuke. This article will cover the first, second and third order effects of a nuclear detonation, but will not be a detailed analysis of the various kinds of such weapons, as for our purposes only the yield of the warhead will make any practical difference in the outcome of the event. Some devices, so called “dirty-bombs,” do not produce much in the way of blast compared to a nuclear detonation, and are in fact not a proper nuclear warhead, but instead are designed to scatter as much radiological material as possible far and wide, hampering clean-up and rescue efforts in the aftermath of a conventional bomb. These devices will be touched on briefly only because dealing with their irradiating fallout is much the same as dealing with the fallout resulting from a nuclear detonation. Nuclear Weapon Basics – What Are We Dealing With? Nuclear warheads come in a couple of basic varieties, fission and fusion. Fission, commonly called “A-Bombs” are the original, simpler and still widely used type of atomic weapon. Fusion, or “H-Bombs,” or thermonuclear bombs are more common in the arsenals of nations with large and advanced nuclear arsenals and are typically more powerful, and far more complex, than their fission cousins. For our purposes, both produce the dreadful effects that we will be preparing to defend against, and it will make no difference which one is heading your way! The power of a nuclear warhead is measured in yield, typically expressed in the equivalent weight of TNT detonated, either in kilotons (thousands of tons), or megatons (millions of tons). The higher the yield, the greater the destructive effects will be. The primary destructive effects of a nuclear detonation are Blast, Flash, Ionizing Radiation, and Fallout. A larger warhead will result in a larger radius of complete destruction at the hypocenter of detonation, and a correspondingly larger radius of severe damage. The Blast is a shockwave created by the intense heat and radiation forcing gas outward from the detonation site, and compressing the surrounding air. It is this shockwave that causes much of the widespread destruction associated with a nuclear bomb. Any building short of specialty blast-resistant structures will be severely damaged or destroyed depending on their proximity to the detonation, up to several miles away. Human beings are subjected to severe overpressure effects in tissues, or are torn apart by the blast wind itself. Anything near ground zero that is above or slightly below ground will be completely annihilated. Flash or Thermal Radiation is emitted on detonation in visible and invisible spectrums. This is the predominant cause of both burns and eye injuries, and will occur far outside the blast range. This thermal radiation is absorbed, transmitted or deflected upon striking an object and raises the object’s temperature accordingly. This can result in the charring and scorching of flammable material. This intense heat is enough to start fires initially, but these are often quickly snuffed out by the approaching blast wave. The initial flash can cause temporary blindness by overloading the amount of light that the human retina can handle. Permanent injury to the eye by retinal scarring can be caused by having the fireball of the detonation in the field of view. The height of the burst and size of the fireball will have a determining effect on permanent eye injury. Ionizing Radiation is released in multiple forms, some moving at up to the speed of light. The principle types we are concerned with during and after the detonation are alpha and beta particles, neutrons and gamma ray radiation. Alpha particles are dangerous if ingested, or inhaled. Beta particles can penetrate living tissue, causing molecular damage, and, if the molecule is DNA, mutation or cancer. Gamma rays are high-energy, and long range compared to other radiation, and deeply penetrating, causing damage at the cellular level. Neutron radiation will render surrounding matter radioactive, including the fine dust and debris that collectively is nuclear fallout. A lower dose of ionizing radiation will produce sickness or long-term health risks, like cancer or genetic damage, while higher doses will cause acute sickness, tissue damage and death in hours or weeks. Nuclear Fallout is any matter that has been rendered radioactive the emitted radiation of the nuclear device. This fallout will settle back to earth after being lifted high into the atmosphere by the explosion, and can sometimes be carried many miles away by prevailing winds and air currents. It forms the primary hazard for days, weeks or months afterward depending on the device, and can adhere to skin, hair, clothing and shoes, being tracked around like dust or mud, including into previously uncontaminated areas. Any exposure or ingestion of fallout will result in exposure to radiation, with the effects accruing depending on the dosage of radiation. 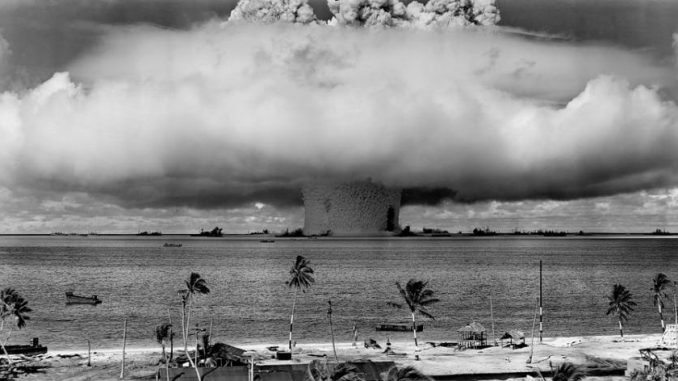 Nuclear weapons also generate a secondary effect, an electromagnetic pulse, or EMP. This EMP is not harmful to tissue, but will damage or destroy any unshielded electronics exposed to it, and disrupt radio communication. Semiconductors and integrated circuits are especially vulnerable to EMP effects. This will result in communications difficulty at the least following a nuclear detonation. While it paints a grim picture, understanding the destructive mechanisms of a nuclear warhead will allow you to better plan against it. Material preparation should concentrate on water, food, medical and trauma supplies, flashlights and batteries, and redundant backup copies of all important personal and legal documents, including physical copies of all important phone numbers. General guidelines below. Food: high calorie, energy dense, shelf stable products, either canned or bagged. Minimal prep required is a plus. Do not forget pet food if you have a pet. Water: a good guideline is one gallon per person, per day. Expect to shelter in place immediately after an event for at least 72 hours, and probably longer. Medical: a basic first aid kit and additional trauma supplies. Add somewhat more preference for additional burn treatments. Include potassium iodide pills; these pills stop uptake of radioactive iodide by the thyroid gland, and are effective at preventing thyroid cancer. These are a preventative, not a cure. Do not forget any critical medication. If refrigeration is required you must have provisions in place for a cooler or ice chest. Protective Gear: disposable gloves and dust-masks or respirators of appropriate rating. Flashlights: stock plenty of batteries. Expect total loss of power for the foreseeable future. Emergency Crank Radio: this type of radio is expected to survive the effects of an EMP. Will be crucial to tune into instructions from responding agencies about severity of aftermath and safety procedures, and does not rely on batteries. Note that radio communications may be atmospherically disrupted after a blast, or equipment may be damaged or destroyed far from ground zero due to the EMP effect. Clothes: a change of clothes can allow you to ditch contaminated clothing for a fresh pair. Documents: anything that you do own that survives the blast may be unrecoverable due to fallout contamination. Have copies of everything important on a flashdrive and on paper as a backup. Expect that you will be able to retrieve nothing from anywhere else. Items to include are things like social security cards, driver’s licenses, car titles, deeds, birth certificates, diplomas and degrees, emergency numbers and other phone contacts. Sanitation: if stashing supplies in a known location. Five gallon bucket with lid, heavy contractor bags, saw dust or quick lime, feminine hygiene products, toilet paper, wet wipes, powder. Keep a general readiness kit with you at all times! You may have a window of opportunity to seek shelter if warned of an impending strike early enough. A BOB or INCH kit should be in every one of your vehicles. If you have to take shelter hastily, the contents of either could be all that you have for several days. Advance prep work should focus on identifying shelter and cover locations around places you frequent in your town or city, like home, school, work, etc., or installing shelter locations at home or work, resources and time permitting. Pay attention to your surroundings while you commute. Remember: mass attenuates radiation! More mass between yourself and the fallout is best. There may be an adequate structure to protect you every few blocks. Any building, especially one with a basement, is better than being in your vehicle or in the open. If resources permit, you may wish to install a subterranean shelter in your home or on your property. Consider your locale: major population centers will be priority targets in a nuclear exchange, as will military bases, defense industry manufacturing centers and certain infrastructure hubs. If you live in or near one of these locations, you will need to be doubly prepared to act quickly in order to survive. Understand that a larger weapon detonating in close proximity is considered non-survivable. If that is a risk you are not willing to take you must consider moving. 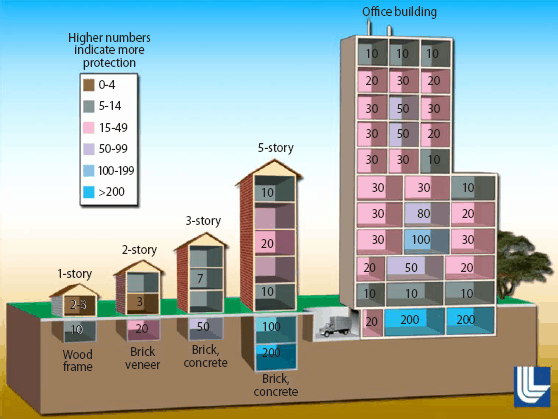 The government rates the suitability of a room in a structure to protect occupants from nuclear radiation with a rating known as Protection Factor. The ideal shelter location is one in a large concrete building, either at the center of the structure or an underground room with no exterior subsurface access point. Structures made from concrete or brick are best. Wood, or light metal structures offer very little protection from radiation. Vehicles offer little to no protection from radiation. See the following diagram for details. If you are warned of an imminent strike in your area, you may have only a few minutes to seek shelter, but these few minutes are sufficient to save your life. Get inside the nearest structure, taking all family members and pets with you. Heavier, stronger materials are desirable. Such a building with a basement or multiple sublevels is best. Move away from windows. DO NOT look for any flash or cloud; you’ll know it when it happens, and the flash can temporarily or permanently blind you. If you are trapped outside when a detonation occurs, take cover behind any large, heavy object between you and the blast or get below surface level if possible. Lie flat and cover your head and face. After the shockwave passes you must find the closest, best shelter: fallout will be on its way down at this point. You may have anywhere from 10-30 minutes before fallout arrives post-blast. Be inside before it arrives. This alone will save you from the worst effects of radioactive fallout, which will lose potency as days pass. You should be prepared to stay inside no less than 24hrs, and preferably 72 hours. If you were caught outside when the fallout arrives, your clothing and all exposed skin or hair will be contaminated, and until you remove it, you will be tracking deadly radiation everywhere. You should strip and discard any clothing exposed to fallout. Do this in an exterior room or antechamber of the building so you do not bring any fallout with you to the safest area. If you must move through fallout or other irradiated areas, do so as quickly as possible, as every moment you are exposed to radiation is injurious, and even brief exposure to extremely “hot” material can make you very sick, or kill you. Once inside an appropriate structure, you must take these few minutes to make the dwelling as impermeable to outside air as possible: close and lock all doors and windows. Close the chimney damper if there is one. Shut off all air conditioners, heat pumps and furnaces. Any drafty doorways or windows should be sealed if possible. Remember: fallout can be as fine as dust or ash, and you must take all precaution to keep it out of your building, off your body and away from you! If exposed, take a shower or wash with soap or shampoo and water to decontaminate your body. If that is unavailable use wipes or washcloths to cleanse any exposed parts of your hair or skin. Pets that were exposed should be gently brushed, then bathed with soap and water in the same manner. DO NOT USE HAIR CONDITIONER: the nature of the conditioner can bind radioactive fallout to hair. If you are dealing with a dirty bomb, and survived the explosion, you should follow the decontamination protocol above as soon as you have reached a safe distance from the site and any possible follow-on explosions. The principal threat from a dirty bomb is the bomb itself, not its radioactive material. As soon as you can, utilize a crank- or battery-powered radio to tune in to a public notification frequency. Listen for broadcast instructions on evacuation procedures and routes. Note again that the worst threat from fallout will be in the 24 hours following the detonation. When selecting food, water and medication for consumption, any sources that were inside a building, away from fallout, or brought inside a safe location before fallout arrived should be safe to consume. DO NOT eat or drink from any sealed containers exposed to fallout, or from any source that may have been exposed to fallout somewhere in the distribution system. Ration safe food and water to ensure you can endure in place while sheltering. If you have the opportunity to help someone else by letting them into your shelter, you may choose to do so, but you must assume they have been contaminated by fallout; Any one that is showing symptoms like nausea or vomiting, burns, seizures, tremors or lethargy may have been exposed to strong radiation in a short period of time, and suffering from Acute Radiation Sickness, or ARS. Follow the decontamination procedures listed above, and understand that some risk must remain as they could be irradiated themselves. This is something you must consider before the time comes. When the time comes to evacuate, follow instructions from nuclear response agencies and personnel closely. A nuclear detonation is one of the most destructive events imaginable, and will doubtlessly cause many deaths and widespread devastation, but it is survivable if you take the appropriate action before, during and after the strike. Do not let fear or awe keep you from taking sensible, achievable steps to survive and prevail after a nuclear strike. Time spent thinking about a solution now will save precious seconds and prevent panic prior to the event. under “Protective Gear” you definitely want a one-piece Tyvek suit (Tychem material for crossing over for pandemics) – pull on rubber boots – elbow high rubber gloves – plenty of duct tape to seal all the open seams ….